Stewie sure is huge in cuddly form! Jumbo plush based on the Family Guy TV show. He's just right for any Seth MacFarlane or Family Guy fan! As small as he may seem on the Fox TV show Family Guy, Stewie sure is huge in cuddly form as this Family Guy Stewie 14-inch Plush! Whether you've got a Family Guy fanatic in mind or you want this ginormous fellow for yourself, you're going to love the huge size of this plush. Maybe you're a big Seth MacFarlane fan or you know someone who would cherish this soft funny guy. Either way, you're sure to find a happy home for the Stewie Plush. 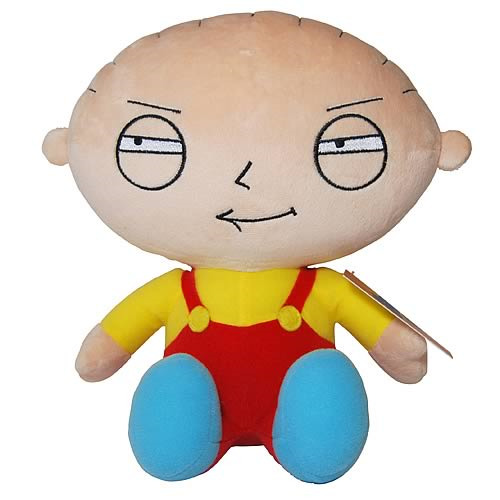 Give the gift of Family Guy with the Family Guy Stewie Jumbo Plush! Stewie measures 16-inches wide x 14-inches tall x 10-inches long. Ages 8 and up.